This structure is called an “inverted pyramid.” Journalists write a summary and place it at the top of an article, allowing readers to get the gist of the story from the opening few paragraphs. This “first news first” approach has been a journalist’s go-to format since the rise of the telegraph and expansion of newspapers in the 1800s. Reading the first 100 words of an article makes sense when you face wading through a thick, daily newspaper. You get a grasp of lots of different pieces of news in a shorter time. Now, decades later, it’s the preferred structure for web users too. Bloggers have discovered that just half their readers actually read past the first 100 words of a post. Web usability stats tell us the same thing: eye tracking studies report that web users read an average of just 20% words on a web page. Your readers can dip below the first 100 words if they choose to dig deeper. The content explosion has limited their reading time. The “first news first” rule of thumb puts your reader’s needs before your own. 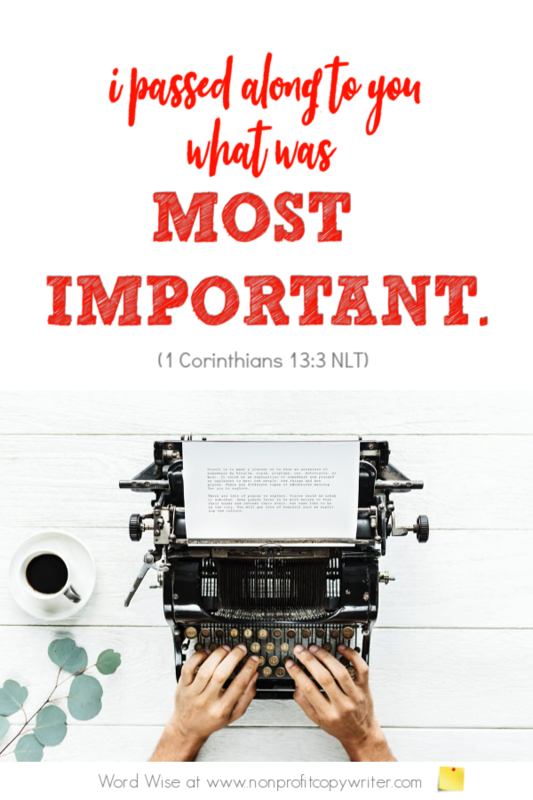 Paul shared the importance of prioritizing your content for your readers: “I passed on to you what was most important” (1 Corinthians 15:3, NLT). He wanted to make sure his readers got the message that Jesus died for them. Shouldn’t we put our readers’ needs first, too? Let your first 100 words put your reader first. I confess that at times, I become attached to my words. Let me put my reader’s needs first. Show me how to write a summary and place it near the top of content so my reader can gain a quick understanding of my point. Two Words: Which Should I Choose?